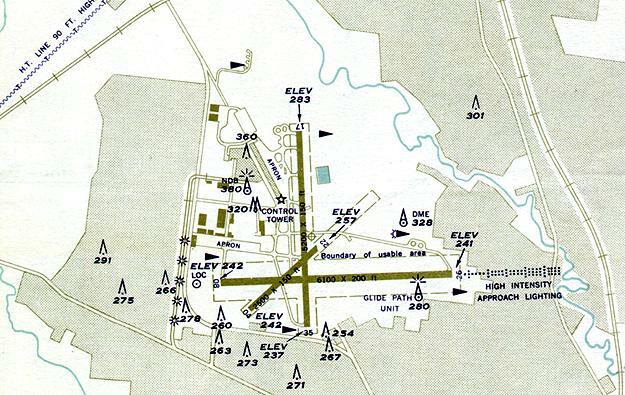 The layout of Melbourne's Essendon Airport, taken from the Landing Chart dated 15 Aug 1960. The basic layout of the aerodrome is still the same (at 2004), although notable is Runway 04/22 which does not exist today. Other notable features are the open areas to the west, north and immediate north-east which are all heavily built up today. The diversion of the Bulla Rd (now the Tullamarine Freeway) to the west of the airport can be seen. The original course of the Bulla Rd can also be seen running south-east to north west. The 1956 Control Tower is in situ at the end of the hangar line located along the course of the old Bulla Rd (now Wirraway Rd and the home of the Airways Museum). The DME beacon at the eastern side of the field was a Domestic DME and was de-commissioned with the rest of the network in 1995. Click here to see a photo of this beacon.